Every week a a frankly stupid amount of new restaurants, cafés and street food joints arrive in Kolkata. Though the tasty newcomers doing bold new things could be a distraction, the seasoned stalwarts never fall out of fashion. Oudh 1590 is one such player, and with them setting up shop in North Kolkata now, they've covered all four compass directions in the city. Don't just keep scouring Netflix or the tele, if it's period drama you fancy. Add a bit of this fancy to your plate to get the full experience, and Oudh 1590 is the place to hit up take your palate back in time. A popular foodie haunt with three outlets spread across the city, it's fourth one has opened doors in Lake Town to treat North Kolkatans. Taking its name from the erstwhile princely state of Awadh (or Oudh), this period-themed eatery is dedicated to give you the royal indulgence when it comes to food and ambiance. Sticking to Oudh's signature Indo-Saracenic theme, the Lucknowi dining room set up will evoke the past to complement your food. 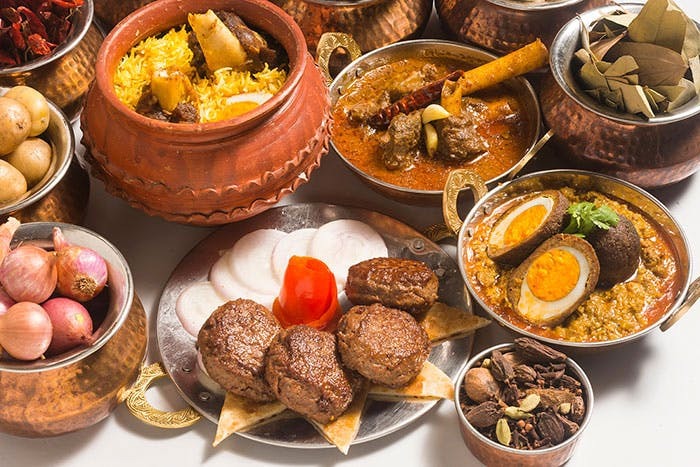 Recreating a mini Awadh in time lapse is no mean feat, and Oudh's 'Dum Phukt' style spread of Galawati Kabab, Kakori Kabab, Nalli Nehari, Keema Kaleji or the famed Awadhi Handi Biryani is a brilliant move towards it. For a city of biryani lovers, this one doesn't get old, no matter the overwhelming choices available, and, thankfully, North Kolkatans can now cut down on the commute to feast like a raja without worrying about the distance. Finding it difficult to spot the new outlet? Head over to Kalindi in Jessore Road and it won't be a task to spot it.